Kaprun is a village in the Pinzgau area of Salzburg with a population of approximately 3,000. Kaprun is situated close to the central mountain range of the Alps, within the National Park Hohe Tauern, and a famous skiing town. Kaprun is well-accessible from neighbouring Zell am See, the local county town with which it joins efforts in advertising the area as the travel destination "Zell am See - Kaprun". Apart from skiing, the town is also well-known for its local dam including a major reservoir. The highest mountain of Kaprun is the Großes Wiesbachhorn with 3,570 metres - the number 7 in Austria′s ranking of its highest mountains. 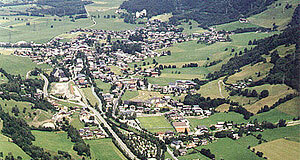 Historically, Kaprun was a sleepy village that lived off agriculture and forestry for millennia. There are traces of Illyrian mining, but the extent of this is not clear - Kaprun was probably never a big mining centre. The name of the village was first mentioned in a document dating back to the 9th century, it is derived from the Celtic name Chataprunnin (white water). Things changed only during the time of WWII, when the Nazis decided to build a major power plant in Kaprun. The valley was to be blocked in order to create two large reservoirs - the so-called Tauernkraftwerk. The construction work was started with Jewish slave labourers that were kept in a camp at Kaprun. The work conditions were very hard, a situation that the Austrian Nobel laureate Elfriede Jelinek made the central theme in her play "Das Werk". After the end of the war, the construction continued the conventional way. The power plant was opened in 1955 and became a symbol for the reconstruction efforts of the "young" Austrian nation - completely ignoring the dark starting point of the plant. Kaprun became an icon of optimism. Currently, the Tauernkraftwerk is being modernised. Once this is completed in 2012, the power plant will supply 10 percent of the national electricity demand. In 1963, the construction of ski lifts to the glaciers of the Kitzsteinhorn at the doorstep of Kaprun started. It was the first glacial area in Austria that was to be exploited for skiing and allowed (and still allows) all year round skiing vacations. Today, the Kitzsteinhorn is still highly popular for summer skiing and closed only for maintenance work in late summer, usually for a period of four weeks. In collaboration with Zell am See, the tourism region "Zell am See / Kaprun" offers some 14,000 beds and sells almost 2 million over-night arrangements per year. This makes the area one of the most touristy in Austria. This is mostly due to skiing; in addition to the Kitzsteinhorn glacier area, Kaprun has a second skiing area at the Maiskogel. In 2005, Kaprun gained worldwide attention when a ski lift caught fire and 155 people died. The lift (Kitzsteinhorner Gletscherbahn) went through a tunnel, which created the same effect as a chimney. It was one of the biggest disasters/accidents in Austria′s post-war history and led to a long and internationally noticed lawsuit. During the summer months, the lakes of the Kaprun reservoir are popular hiking destinations. Other attractions include Burg Kaprun, a castle from the 12th century. It now serves as a cultural venue and offers rooms that can be rented for private occasions. Note also the Sigmund-Thun-Klamm, a 32 metre deep gorge that makes another attractive hiking destination. A major attraction of Kaprun is currently under construction: The "Tauern Spa World" will make use of recently discovered thermal springs. The major swimming pool and spa park will probably open in 2010.